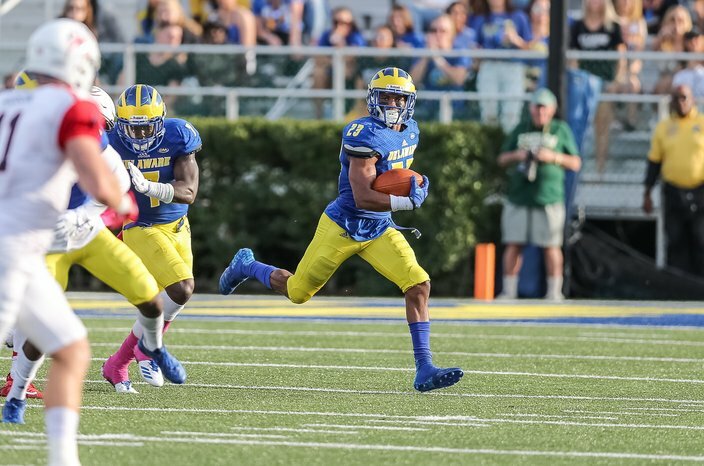 Delaware's Nasir Adderley is one of the best defensive back prospects in next month's NFL Draft. Late next month, Nasir Adderley will be nestled somewhere at a table with family and friends in a green room in downtown Nashville, Tennessee, absorbing his surroundings and everyone gathered around him. He’ll be impeccably dressed, with maybe some bling in his ear, when it may dawn on the 2015 Great Valley High School graduate how fortunate he is to be there among the top college football players in the nation about to be drafted into the NFL. The 6-foot, 206-pound defensive back out of Delaware finds himself among the top safeties in the country and projected to be a late first-round or early second-round draft pick. Adderley, the third cousin of NFL Hall of Famer Herb Adderley, a three-time Super Bowl winner, took an arduous route to arrive on NFL draft boards. It’s frustrating when I look back at everything. I got in my own way. It was a rude wake-up call and the whole experience made me who I am today. The bloodline was always there. Though deep down, Nasir feels, this journey was very close to not happening at all. Actually, Nasir has to be corrected. He did struggle academically in high school, though not because he lacked the intellect to succeed. He was always considered a highly intelligent kid, going back to middle school. What Nasir admits was that he was lazy. “I’ll be honest, I was ashamed of it,” Nasir said. “When I applied myself, I got on the honor roll and schools began coming back and recruiting me. This whole thing could have gone sideways, and I could have wound up at a junior college. But I believe everything happens for a reason and if anyone hears my story, my message it simple: Take your academics seriously. Nasir had a great junior year at Great Valley. As a two-year starter, he finished his high school career defensively with nine interceptions, three he returned for touchdowns, three forced fumbles, and seven touchdowns on kick returns. Pitt, Rutgers, Maryland, Penn State, Temple, they all came in to talk to Nasir. Every day, Nasir was getting called down to the athletic office to speak to college coaches. They all had the same message, punctuated with a “but,” or a “however” in the conversation. “It was extremely frustrating, because I knew, athletically, they loved me,” Nasir said. “Every day I was getting called out of class to go down to the office and speak with another coach. I knew what was going to happen, because they were afraid that I wouldn’t clear. I knew at the end they were going to tell me that they couldn’t take me. So, Nasir chopped out weekends. That’s when he applied himself academically and changed his course. “I remember telling the younger kids coming in to not make the same mistakes I did,” Nasir said. “I told them to take the education here seriously. The whole thing woke me up. I stopped hanging out with people, and it’s something I even did going through college. That came almost immediately at Delaware. The Blue Hens got a steal. 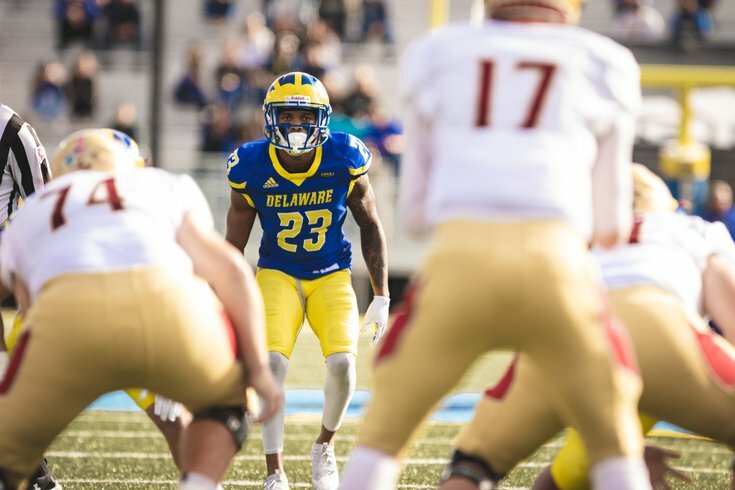 Adderley started as a true freshman and after his senior year, he was named second-team AP FCS All-American and first-team all-Colonial Athletic Association in 2018, leading Delaware with four interceptions and seven pass breakups, to go along with 87 tackles (1.5 for loss), in 12 starts. He also returned five kickoffs for 149 yards (29.8 average), scoring once. What always impressed Rocco was Adderley’s ability to cover large amounts of ground and close quickly on the ball. In one game against Richmond during Adderley’s junior year, Spiders’ quarterback Kyle Lauletta (the New York Giants’ 2018 fourth-round draft pick) tried throwing a few balls over Adderley’s head. It didn’t work. “We saw Nasir do a lot of impressive, extraordinary things at both corner and safety in high school, and when we moved Nasir to safety, where he’s played both front side and back side, he was able to show a different skill set,” Rocco said. “Nasir may be most valued in the NFL as a free safety, because of his range. “On third down, he can be a nickel covering the slot, and his stature, he may not be featured as an in-the-box safety. Almost all of the NFL teams have contacted me about Nasir. Within the last six weeks of our season, I would say almost everyone was in here and they were interested in Nasir. With the Senior Bowl and NFL Combine, his stock has nothing but rise. Nasir is very efficient in his movements. He covers an extraordinary amount of ground very fast. He has that kind of refined movement and transition and close on the ball as a tackler, and play and catch the ball in the air. Nasir’s grandfather, Nelson Adderley, is Herb’s first cousin. Nasir refers to Herb, who he is on the phone with two, sometimes three times a week, as “Cousin Herb." “Herb told me to focus on being the best me that I can be and not compare myself to anyone,” Nasir said. “I never played cornerback before and when I made the transition, he helped me with that process with lining up and attacking the ball like I was a receiver. Could Delaware's Nasir Adderley wind up playing for his hometown Eagles?